Interested in helping interpret history? Consider becoming a Kelley House Museum docent! Enjoy the wonderful camaraderie with fellow House Museum docents and staff. You’ll have the opportunity to learn from experts in the field of historical preservation. Share your passion for Mendocino with others in our community and beyond. 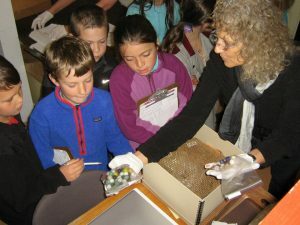 A docent is a volunteer educator. Historically, a docent lectured while visitors listened. Today’s dynamic docents at the Kelley House Museum create and facilitate conversation-based tours that bring history to life. Our docents learn the original stories of our town and the colorful characters who lived here over the years. Thorough training comes with the additional benefit of easy access to our extensive archive collections. You can volunteer as little as one day a month, from 11:00 a.m. to 3:00 p.m., or sign up for more days. For more information about the Kelley House Docent Program, contact Anne Cooper at 937-5791 or e-mail curator@kelleyhousemuseum.org with “Docent Recruitment” in the subject line. Volunteering: more than simply doing a good deed. To learn more about our volunteer opportunities, please call us at 707-937-5791 or email info@kelleyhousemuseum.org. Volunteers have an enormous impact on the health and well-being of any community. 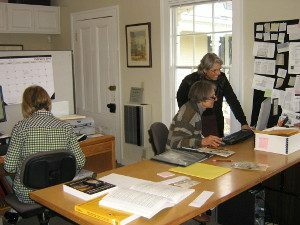 They are critical partners and participants in helping the Kelley House Museum sustain its mission to preserve and share the rich history of the Mendocino Coast for generations to come. Volunteering can be a great way to develop new skills, learn more about career options, make friends, garner new professional contacts, get exercise, spend time with neighbors, or even just shake up your routine. 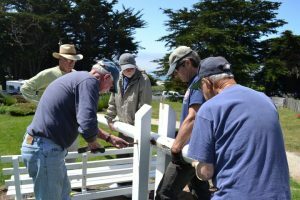 As a volunteer, you become a member of our dynamic team and have the opportunity to learn more about Mendocino Coast history. If you have a few hours to spare and a willingness to help, we can match your skills with a fun and interesting job. Give us a call! Historical research: Contact Anne Cooper at 937-5791 or email curator@kelleyhousemuseum.org if you would like to volunteer in our archives. Exhibit Developer: We are always looking for new ways to improve the visual appeal of our exhibits and artifacts. We need your talent in research or design. Interested? Contact Anne Cooper at curator@kelleyhousemuseum.org. Walking Tour Guides: Bring history to life for visitors on a walk around historic Mendocino, while highlighting pioneer homes and meeting places. Interested? Contact Jane at info@kelleyhousemuseum.org. Building and Grounds Maintenance: A jack-of-all-trades is what is needed here. This person’s list of duties would include tightening screws and touch-up painting, and the ability to recognize a more serious maintenance problem before it develops. Interested? Contact Kevin at info@kelleyhousemuseum.org. Data entry & Office Assistant: An extra pair of hands is often needed in the office to tackle some of the administrative tasks, such as mailings and database management. Interested? Contact Cindy at info@kelleyhousemuseum.org. Special Events: We put on a variety of events throughout the year and the volunteer tasks range widely. We can always use someone with enthusiasm and talent to help host a great party. Interested? Contact Cindy at info@kelleyhousemuseum.org. Writers: Volunteers are needed to write historic articles, local news stories or help with our newsletter, social media posts and website copy. Interested? Contact Anne at curator@kelleyhousemuseum.org.